It was the beginning of a long night of darkness, fear, and isolation for the Israelite people. The approximate date 586 BC marks the beginning of the Babylonian exile. The city of Jerusalem had fallen to Babylonian warriors. The temple in Jerusalem was destroyed. The sons and daughters of Abraham and Sarah were carried captive to a foreign land. The land promised to Abraham, approached by Moses, possessed by Joshua, ruled by judges, expanded by kings, and loved by all Israel was now miles and memories away. But deep within the memories of the Israelites was a library of stories and songs. Desolate moments drive us to find peace and hope in the stories and songs that move amid our memories. The books of 1 and 2 Samuel contain a collection of stories (and even a few songs) from Israel’s memory that fostered hope for fearful readers. These stories took place in the lives of Samuel, Saul, and David between 1020 and 961 BC. While these narratives certainly have historic significance in the context in which they occurred, their greater significance may be found in the context of when they were recalled, recorded, and retold. 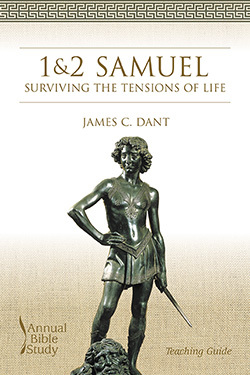 Most scholars believe that the stories in 1 and 2 Samuel were compiled and written during the period of Israel’s history leading toward and through the Babylonian exile. More than three centuries after these stories occurred, they were remembered and retold. Why? Why were these stories recalled during the exile? What do these stories say about God and Israel? How did these stories bring peace and hope to the long dark night of Israel’s captivity? Is it possible that these stories can bring hope to the tense and tumultuous times of our lives as well? James C. Dant has served as Pastor of Highland Hills Baptist Church, Macon, GA., Adjunct Professor at Mercer University, and has been a writer for Baptists Today and the Smyth & Helwys Uniform & Formation Bible Study Series. In the teaching guide, each chapter includes teaching options, a suggested worship outline, and approaches for leading discussions. The adult study examines biblical background, history of interpretation, and the themes of spirituality, ministry, and theology. It also includes relevant lesson plans for children and youth. Our study guide is designed to enrich the learning of lay participants by serving three purposes: to educate the learner on major issues of appropriate interpretation, to offer an overview of theological themes, and to build the learner’s Bible study skills by reviewing significant interpretations along with their themes.